A series of 10 brightly coloured flags greeted visitors to Neyland in October 2010 marking “Migration: Echoes and traces” Neylands’ festival of community arts that took place in venues around the town from 22–29 October. 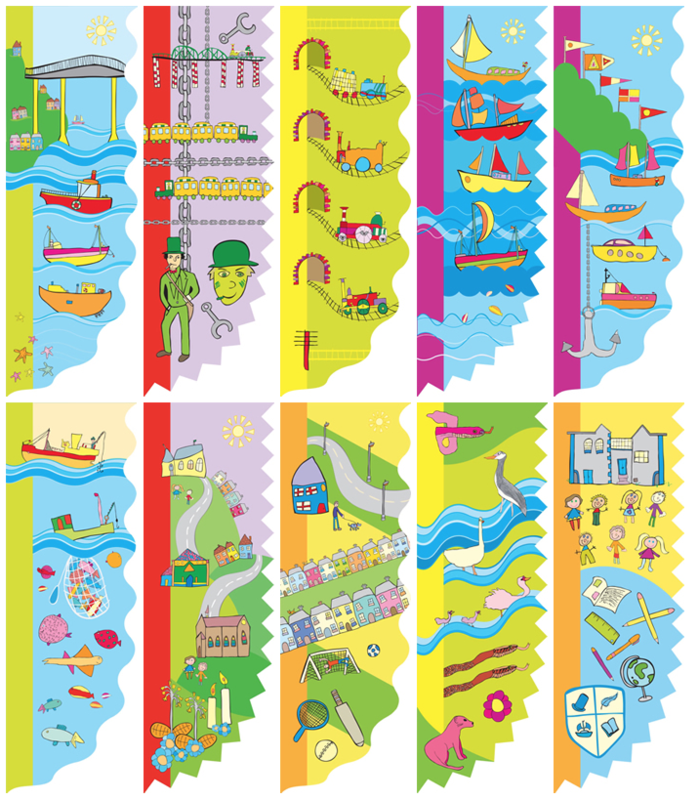 The flags, celebrating different aspects of the town’s rich, but largely hidden culture and heritage, were designed by the children of Neyland Community School working with Visual artist Pip Lewis and Illustrator Joelle Brindley. The festival marked a new phase of Rite of Passage, a community heritage and public art project working to raise awareness of and celebrate 50 years of Irish immigration from Waterford and Cork through Neyland and on into South Wales. As in 2008, the town library acted as a hub for the festival hosting two exhibitions and an opening night concert. Composer and musician Helen Adam and George Whitfield, who play together as the duo Fiddlebox, worked together on Salt in the Air, a project involving pupils from years 5 and 6 in Neyland Community School exploring, writing and performing sea shanties. Older members of the community were the focus for Christine Willison, a storyteller who spent the autumn gathering memories, stories, historical anecdotes and poems to be included in a collection entitled Tales of Neyland. Readings from the collection were given at a celebratory afternoon tea in St Clements Church Hall on Wednesday 27 October. The festival was planned by the Brunel Festival Association working in partnership with spacetocreate, members of the community and with the support of the Milford Haven Port Authority and Pembrokeshire County Council.